The folks at Urban Hike are back with a new neighborhood walk for their first hike of 2010. Urban Hike is a group of folks that plan hikes around urban areas – the urban Hike team heads out before hand to map out a route and learn some history of the area. They often recruit some local experts to join the hike and share more about the area. 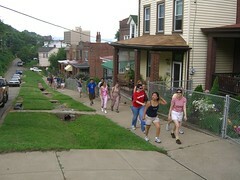 We hope you’ll join us for the 2010 inaugural Urban Hike on Saturday May 8th in Brighton Heights. We’ll meet at Friendly Grounds, 3619 California Ave, at noon. There is metered parking in front of the coffee shop, but if you go just one block further (past Davis) you can find free on-street parking. Or, avoid the parking dilemma altogether and take the bus – the 500 stops just outside Friendly Grounds. Bring plenty of water since we will have to climb a couple of hills to enjoy the surprisings vistas of the city (that’s why they call it Brighton *Heights*). And of course we always recommend sunscreen.